Activities: Runs NEKOREKORDS. Multi-instrumentalist, focusing on junk metal percussion, self built nonstruments and junkstruments after many years of guitar and bass in several punk rock and experimental bands. Also a self-taught sound engineering and recording enthusiast who has recorded, mixed, and/or mastered over 100 finnish underground releases, and travelled with several bands as a FOH engineer. dig it. Argh. Maybe it was more interesting for them than it is for me. ABELA is carrying this flag amazingly, mike muncher with fx belt!! fun to see what’s goin on than “just” listen. narrative, the choice of sounds, just what the doctor ordered…. human beings than the elements that remind me of it. and easily my favorite of the bunch. Dirty and insane disco from hell!! This release brings about many reflections. Not only those about its aesthetic aspect but also those referring to its cultural significance, as it seems to be located somewhere on the fringes of contemporary independent music. 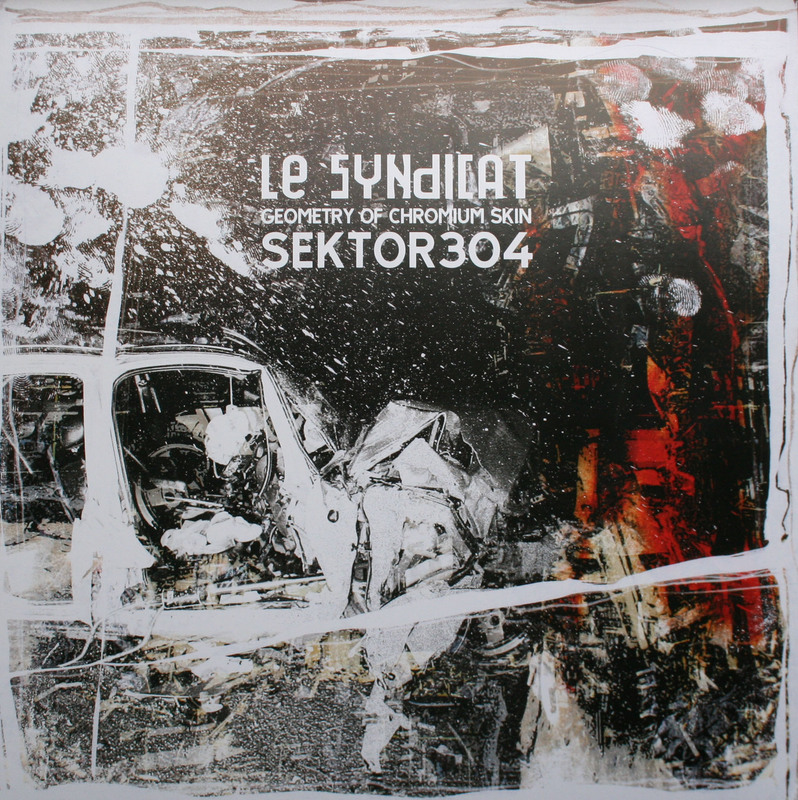 That is considerably due to the distinguished French industrial music veterans LE SYNDICAT, recently revived although about 20 years ago the project seemed to have definitely ceased musical operations, having used up its potential. Active since 1982, it has evolved stylistically in the directions that didn’t necessarily satisfy audiences. The group’s undisputed leader, RUELGO, has meandered in his pursuit after the optimal language of bruitist expression into various areas, see ‘Festin D’Acier’ and ‘Propagation’ released in 2010, which rather dampened than aroused the initial enthusiasm about LE SYNDICAT’s comeback after a long hiatus. It isn’t him, however, who was the prime mover behind this album but a drummer João FILIPE of the SEKTOR 304 duo (where his partner is André COELHO, also of KULT, and others), dealing in the means of expression of the industrial avant-garde of rock music. While their relation, initiated following a long-time fascination of the two Portuguese with LE SYNDICAT’s work, is exclusively of virtual nature, the artistic result of this long-distance co-operation seems generally successful for a number of reasons. Firstly, it deftly marries digital sound processing and electroacoustic collage techniques with analogue sound of conventional acoustic instruments and metallic sounds of self-made percussion instruments. Secondly, its multi-thread and elaborate sonic narration is painstakingly executed, with moderate use of loops and repetitions. And thirdly, considerably owing to guest appearance from a promising avant-garde drummer Gustavo COSTA, it makes a versatile use of irregular rhythm sequences of varied tonality. Rhythm also serves another, possibly a greater purpose here. It acts as a bonding agent between the chaotic ambience sounds and a wide palette of dissonant feedback, processed vocals, dark reverbs and low-range electronic static. This, however, raises doubts related to a broader issue in industrial music: is rhythm a formally justified tool for control over noise? This release clearly shows an effective and impressive instance of taming of noise but that in turn may make you wonder whether the chief attributes of noise – rawness and unpredictability aren’t eliminated as a result. The concerns mount up if you give a closer look to the role rhythm plays in particular tracks, its forwardness (‘Geometry Of Chromium Skin’), and synthetic tonality in some places (‘Fallout’). Although the rhythm here is structurally irregular and sufficiently varied, its dynamics seems to overwhelm the other elements of sonic expression, as in ‘Mannequin,’ a composition which evolves splendidly but only up to a certain point. The album is a contemporary homage to the industrial music artists of the first half of the 1980s, retaining a modicum of stylistic autonomy. You can’t miss the references to EINSTÜRZENDE NEUBAUTEN, S.P.K., TEST DEPT or to LE SYNDICAT itself, whose bruitism was permeated with human sweat, dirt, and lunatic spontaneousness. Sadly, it is also a bitter reminder that the industrial music of the 1980s is irrevocably gone. It is one of the anonymous many that are a testament of a kind of cultural decline, resulting from overproduction, information overload, and blind pursuit of technological progress. Paradoxically, the cultural decline is the chief theme here – the atmosphere of civilisational barrenness and soulless technologisation, leading to unavoidable disintegration and annihilation. The eschatological aspect of the album is emphasised through spoken vocals from Manuel NETO, vocals from Antonia REIS intertwined with antimusical textures, which imitates religious transcendence, and references to Nordic mythology (‘Valhalla Errectum’). Standard packaging. 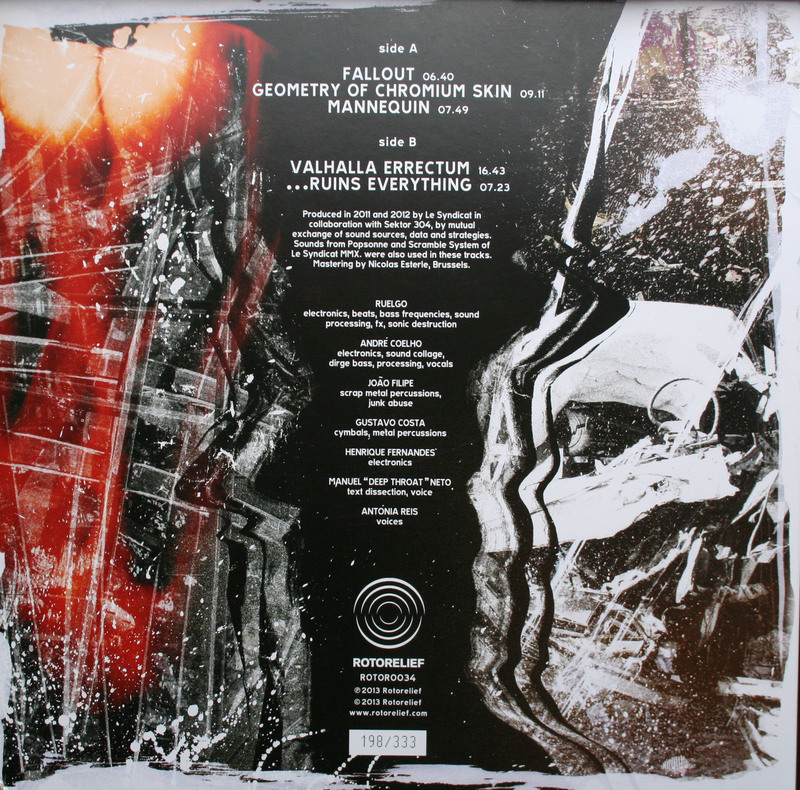 The artwork, indicative of the musical content, was designed by the members of SEKTOR 304 and is a colouristically minimal collage of wrecked cars, fingerprints, abstract deformations, and subtle yellow and red colouration. The liner notes provide exhausting information on the background of the album, mastering, personnel, and instruments and devices used.